During the years 1768-1774. Between the Russian and Turkish fleets the war lasted. Ivan Aivazovsky did not participate in these battles, but the historical events that took place inspired the artist to create several canvases dedicated to these battles. In 1880, after the end of the war, Aivazovsky wrote a picture “The capture of the Turkish sailors by Turkish sailors and the release of captive Caucasian women.” In a stormy sea, Russian ships from several sides are trying to seize the Turkish kocherma. Vessels are heeling from strong waves. A mast has already been broken at the cossack. Russian sailors, despite the storm, are ready to fulfill their mission and release the captives. Rowers from the last forces are fighting the sea element. The evening sun illuminates everything around with a rich yellow glow. Only glimpses of a rich blue sky are visible at the top of the picture. The yellow color of the sun also reflects on the ships. The white sails of the Turkish kocherma are painted in yellow-orange hues. Transparent waves are written in shades of yellow, green, blue and emerald colors. Their rapid movement also complicates the difficult situation. Looking at the picture, the turbulent movement of ships along the surface of the sea is well represented. On the right side of the picture there are mountains, which means that the action takes place not far from the land. The whole color of the picture conveys the tension of the whole action. The Turkish kocherma has almost been captured, the Russian sailors have coped with the task. No wonder the artist portrays the sunset in this landscape, he seems to say that everything is coming to an end, and the day and the battle. The historical content of the picture Aivazovsky skillfully combined with a magnificent beauty of the landscape. 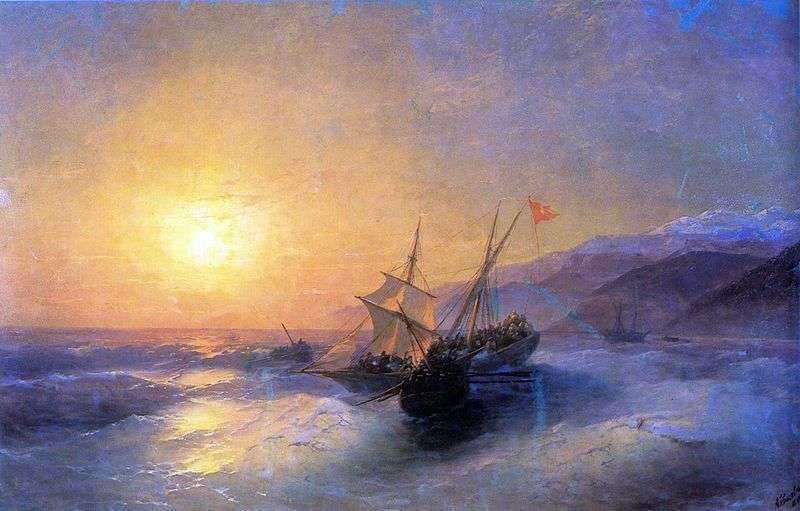 Description and meaning of the painting Taking Russian sailors of the Turkish kocherma by Ivan Aivazovsky.